Holidays are stressful when mobility is an issue. We always go away with my sister and her family as the kids are similar ages and we all have a good time. We like to all stay together in a house as self-catering is the most flexible option with children and then the grown-ups can relax with a glass of wine (or 5) after the kids have gone to bed. Over the past few years I’ve found hidden “traps” within the properties we’ve chosen that an able-bodied person wouldn’t notice. A house in York, for example, had 4 toilets, all of which were upstairs! You can imagine me heaving myself up the stairs in a panic after the long journey there! It was interesting after a few glasses of wine on subsequent evenings too and I got stuck in the shower one morning because I couldn’t lift my heat intolerant legs up the marble steps! Last year we stayed in a chalet on the Isle of Wight which was great except for the 2 steps up to the front door (with no handrails) this kept me a prisoner inside unless we were going out for the day when I could justify the effort it took me to get out! Anyway, this year I decided to book early and do it myself to make sure I found somewhere I could manage. I found an amazing website called “Can do Holidays” (www.candoholidays.com) where all the accommodation is gloriously accessible! 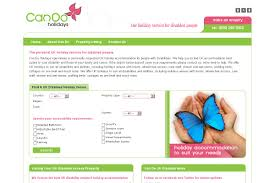 According to their website, Can Do Holidays is a, “UK specialist travel service that offers disabled travellers adapted holiday accommodation to suit their individual needs” and it does exactly what is says on the tin! There is a search function where you enter the destination and property type followed by the adaptions you need. In my case I just need it to have wheelchair access so I can drive my scooter in and out but I also asked for an accessible bathroom to avoid getting stuck! You can ask for adjustable beds, hoists or adaptions for the visually impaired too. Due to the large number of bedrooms needed and the vague nature of my destination choice (somewhere in the South of England) the search didn’t find any properties so I used the “make an enquiry” tab and emailed my requirements. I got a quick and friendly response followed by a list of properties that matched my requirements. I also got an assurance that all the properties are personally vetted by Can Do Holidays to make sure of the accessibility. I’ve now paid the deposit on a lovely cottage in Norfolk with a downstairs bedroom and wetroom for me and upstairs bedrooms for everyone else so they don’t feel like we’re staying in a hospital! I’ll be able to charge about on my scooter downstairs without fear of having any toilet accidents and it cost no more than cottages we’ve stayed in before! This was a hassle free experience that I will be repeating next year! Well done Can Do Holidays!